Extending her brilliant run this season, seasoned Tejaswini Sawant nailed a gold in the women’s 50m Rifle Prone event on the opening day of ISSF World Cup Rifle/Pistol stage in Munich. 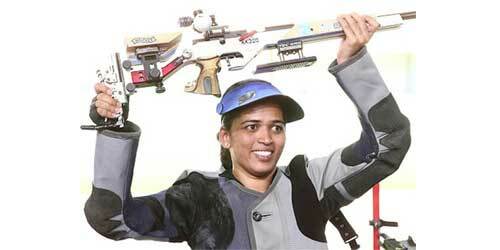 Sawant had won a gold at the recently-concluded Gold Coast Commonwealth Games in Australia. Chain Singh also won a silver in the men’s 50m Rifle Prone event, shooting a score of 627.9 to finish behind USA’s Matthew Emmons, who took gold with a score of 628.9. Among other Indian, Shreya Saxena finished ninth in the women’s Prone event with a score of 619.1 while in the men’s event, Gagan Narang and Sanjeev Rajput shot scores of 621.7 and 621.2 to end in 32nd and 34th positions respectively. The trio of Apurvi Chandela, Mehuli Ghosh and Anjum Moudgil will spearhead India’s challenge in the women’s 10m air rifle, first of the 10 Olympic event finals.